I am not one of those people who likes to spend hours in the kitchen preparing a meal. I love to cook and bake but I don't often have the time to prepare large, involved meals — the simpler and the quicker, the better. So today I made a fast and easy chunky tomato sauce and spaghetti dish for lunch. My easy tomato sauce is made with fresh tomatoes and looks and tastes like it took hours to prepare. But really? The whole spaghetti meal took under an hour to make. There's a secret to cooking the flavorful sauce so quickly and I'll share that with you in the coming week. 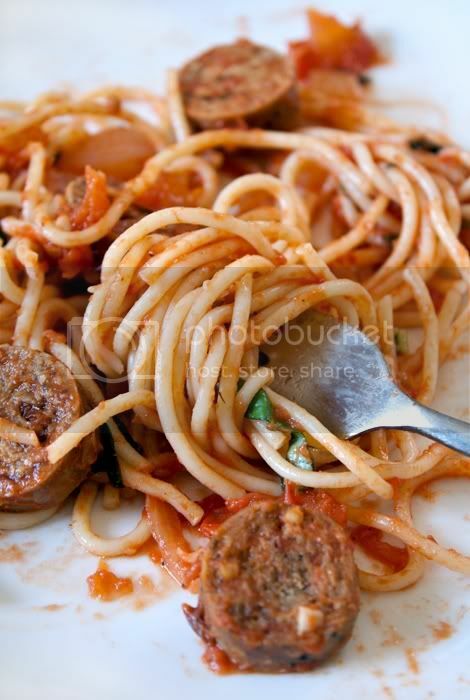 Spaghetti would be excellent tossed with this sauce on it's own but I happened to have a few Italian veggie sausages in the fridge, so I chopped them up and added them to the dish for extra protein and a meaty bite. It makes a wonderful weeknight dinner; so easy to put together for one, two or a whole family. Also coming up on The Kitch next week: an awesome veganized recipe for Tyler Florence's Big Fat Chocolate Chip Cookies. They're big, fat, chewy on the inside and crispy on the outside — perfect for lounging around and scarfing down with a cold glass of almond milk on a lazy day. I'll catch up with you and share the recipe for those cookies on Tuesday. Until then, have a wonderful weekend!